The 2019 National Marty Monologues Tour! This is the schedule for the upcoming Marty Monologues show and tour! We’ll be at the Apollo Theatre in Peoria on April 7th, then Tuesday, April 9th we’ll be doing the show at The Cornservatory in Chicago and we’ll wrap it up on Thursday, April 11 in New York City at The Kraine Theater. More details can be had at the Marty Monologues facecrack page. So far the after-show parties are going to be at Kenny’s Westside Pub in Peoria and at Slainte in New York City. Chicago’s after-party will be announced soon! Here’s the new poster designed by Chelsie Tamms from Lettering Works. The next show is going to play in Peoria, Chicago and New York City! This is all making me excited and nervous! There’s now a facecrack page dedicated to the Marty Monologues Show. There’s new artwork by Chelsie Tamms at Lettering Works and updates about the next shows happening in April in Peoria, New York and Chicago! Click here to check it out! 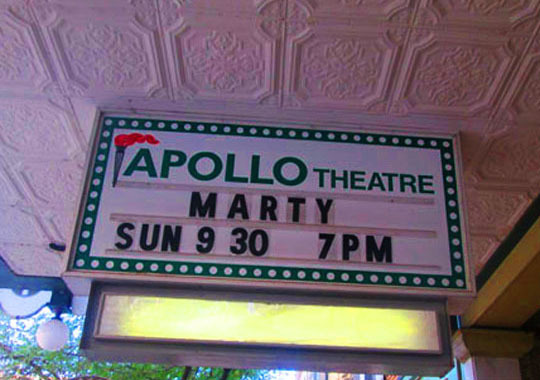 I’m happy to report that the first Marty Monologues show was a great success! Over 80 people showed up and everyone enjoyed the show and I made it through without throwing up! To see the blog post and more photos from this evening, click here: The Marty Monologues. Thanks to everyone who showed up, everyone who worked on the show with me and now it’s on to show number two! I’ve booked the Apollo for Sunday, April 7th, 2019 for the next one! I’ll be revealing more about that show, which we may take to other stages beyond Peoria! Stay tuned and thanks for the support! I'll be updating this page with photos and information as we get closer to the show date, so please check back! You can buy tickets at the following sponsor locations: Acme Comics, Kenny’s Westside Pub, Lit. on Fire Used Books and Relics Gift Shop. Tickets are 15 dollars for one and 25 dollars for two. If for some reason you can’t make it to these locations, just email me and I’ll get you a ticket. You have to buy tickets in advance, we won't be selling them the night of the show. The ticket also gets you into the after-show party down the street at Kenny's Westside Pub with free chicken wings and prize drawings! Check out the event page at facecrack by clicking right here. Here's a fun interview I did yesterday on Good Day Central Illinois. Click here or on the image to see the interview. All Three Colors of the Marty Monologues Posters! 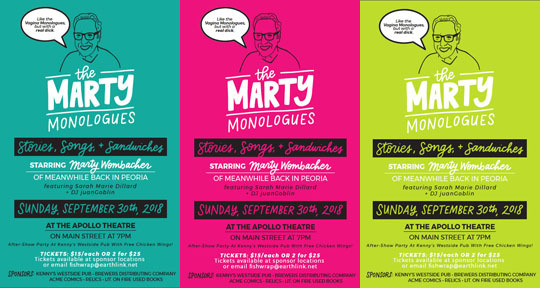 Here's all three colors of the Marty Monologues posters. The artwork and design is by Chelsie Tamms/Lettering Works and they printed and finished by Technicraft. This was a fun interview with Steve Tarter discussing The Marty Monologues among other topics.